We are beginning to learn a lot about the small and very helpful honey bee here on Unreal Facts. Apart from honey, we have found out just how helpful they can be to us, and how disastrous their mating rituals can be. We have also discovered that some bees can sting you more than once. They are quite simply amazing little insects. Which brings us to this fact. 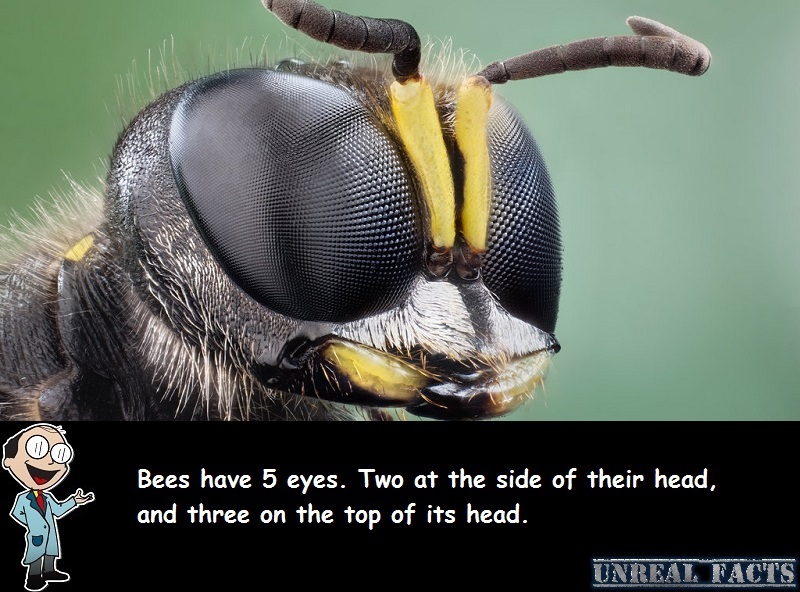 Bees have 5 eyes. But you really wouldn’t know it unless you looked closely. Not only that, but the additional eyes really don’t help it’s vision much at all. In fact, they don’t have as clear a view as many other animals, humans included. So if bees have 5 eyes you would think that they would be some special kind of super insect. Well, in a way they kind of are. They can produce a food that is about as kind as possible to the environment, posses a nasty little defensive sting, and can fly. Yet they can do all of these things, but not see red, even though they have three more eyes than should be necessary. 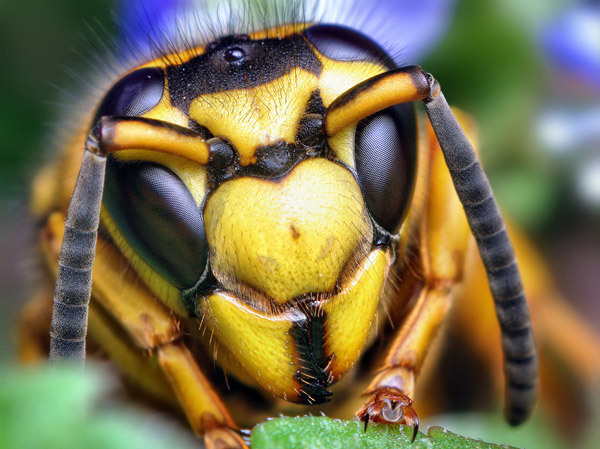 The bee has two large eyes on the side of its head. These eyes are clearly visible, and provide the main source of the insects vision. It also has three additonal eyes located on the top of its head. It is believed that these eyes help with flight navigation. A wider field of view, poor or not, would certainly help with their flight. But what about the quality of their vision? While consensus among experts isn’t exactly agreed upon, they generally agree that the bee can see colors mainly in the blue-green color spectrum, with a touch of orange and yellow. These colors are in the 300–650 nanometers wave length. This completely excludes red from their field of vision. They most likely see red as black. But it isn’t all bad news. While they can not see red, they can see something that human can not. That is ultraviolet light. They use this light spectrum to guide them to their target in the flower. At the center of the flower ultraviolet light is more dense. If a bee is deprived of ultraviolet light they lose all interest on collecting pollen, and will avoid it completely, unless they become hungry.